Bag of parts, RTL SB Stick, Enclosure. 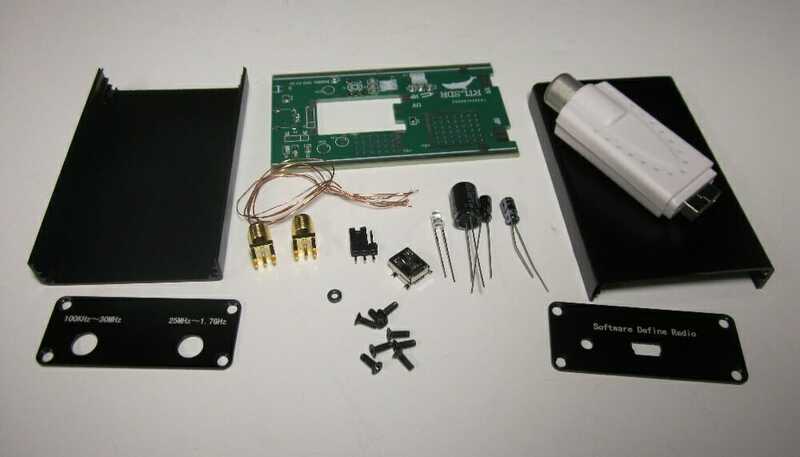 No instructions were included, however, the seller gave a link to a download area for the instructions which included a copy of SDR#. The Assembly instructions were in terrible English, the detailed pictures made up for it. Hint: Magnify the word document 500x to see the little wires! Be prepared to use magnifiers, microscopes, extra small soldering tips, etc. I used a USB microscope and still had problems! The first step wants to cut and drill all the enclosure holes but the enclosure received had them already done. Before starting I used HDSDR to Test Dongle First – just to make sure it was good before continuing. The USB connector on the RTL-USB board was destroying during removal. For some reason getting the solder off without damaging nearby parts seemed to be a challenge. So the solution was to open the shield along the botton slit, peel back the shield and carefully remove one end of the ground at a time. After this the shield and plastic interior slides off leaving 4 long wires which are then easily removed and cleaned out. Tip: I use a quilting needle to clean the holes. Solder the USB dongle board into the carrier board BEFORE attaching the toroid, this allowed putting the board into a PCB vise and avoid damaging the small components near the edge of the RTL-USB board. This also made it easier to measure and trim the toroid wires. Not included were wires to attach the RTL-USB board onto the carrier board. I used excess resistor/capacitor lead clippings for the 6 connections along with bridging the ground connections. Getting the leads on the 2 SMD components was a challenge but not nearly as tough as the toroid wires. You do save the clippings, dont’ you? The Trifilar Wires and toroid itself is extremely small but fortunately each wire had it’s own color which made it easier to identify. Tip: Print the last page of the manual which shows the toroid schematic. Then holding the toroid horizontally identify write down each color on the schematic such as Blue-Top, Blue-Bottom, Red-Top……. Attaching the wires onto to SMD IC was a brutaly painfull process. Out of the 6 hours build time, 4 was spent dealing with the toroid and soldering wires. What was worse is that my finest soldering tip was still a too big to fit between the IC and the capacitors next to them. I ended up using some silver SMT solder paste and my SMD reflow gun to finally get the darned things on. The remaining assembly of the final parts went as planned. This was my smallest Soldering tip!! Remember to change the RTL USB setting to Direct Sampling Q input or it won’t work on the HF area. Low sensitivity, what I was receiving on my IC-725 as S9+20 was coming out about S3 on the SDR software. CHU Canada can be heard over a 3MHZ tuning region. USB mode seemed even less sensitive than LSB. CW had a constant tone which could not be removed. AM had a heterodyne and needed to be zero beat. Could no longer make VHF (FM Radio) work. 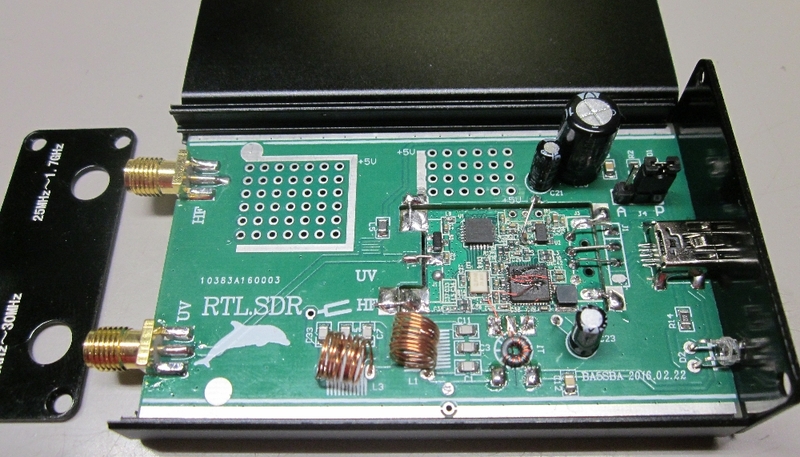 Challenge getting SDR# to work but found I forgot to run install-rtlsdr.bat. Once that ran it worked great. Use the RTL-SDR (USB) for the source and again make sure you are using the Q direct sampling setting. Sensitivy is much better but still a little low compared to the IC-725. But what do you want with a $26 radio? Heard SSB voice and shortwave broadcasts in the 21.0xx area as well as a USB weather station on 28.446MHz. I have heard comments of images above 14MHz. Heard signals up to 12M and down to 80M. 10 (11) & 160M signals were not heard and most AM radio stations were barely heard. VHF works but you need to stop the radio, change from Q back to Quadriture sampling, then re-start the radio. Also change from the HF to the VHF antenna connection. 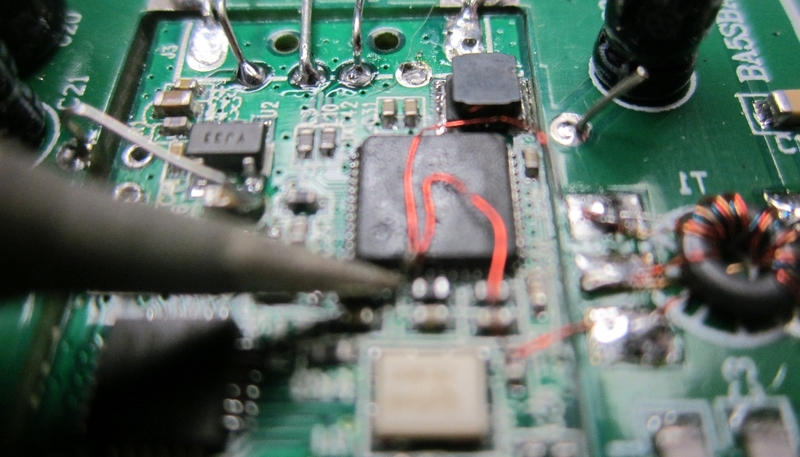 Moved the toroid wires to the I side (pins 1&2) of the SMD IC which did not impact sensitivity or performance. Still a challenge to solder but MUCH easier than pins 4&5 behind those other parts! Tried to use sdr-radio software using the rcp_tcp service (rtl_tcp direct_samp=1), I could see the software changing the frequency, etc via the rtl_tcp monitor windows and received noise. Eventually I found the 40M band around 6.7-6.8MHz but could not find any place for an offset. Signals were also barely audible. FM Broadcast (rtl_tcp – no switches) seemed to work OK. The winner for best signals was SDR#. 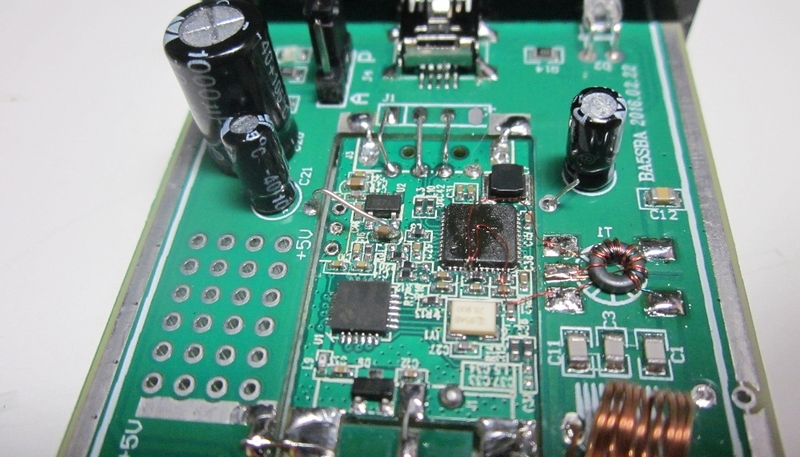 Final Comments: For $26 it’s hard to beat for a cheap HF SDR radio. Would I build it again and play with those little wires on the SMD IC? Heck NO! Once was enough.